Mix one diced chipotle pepper into a 1/4 cup of mayonnaise to make a chipotle mayo. Adjust it to the level of spice you like. 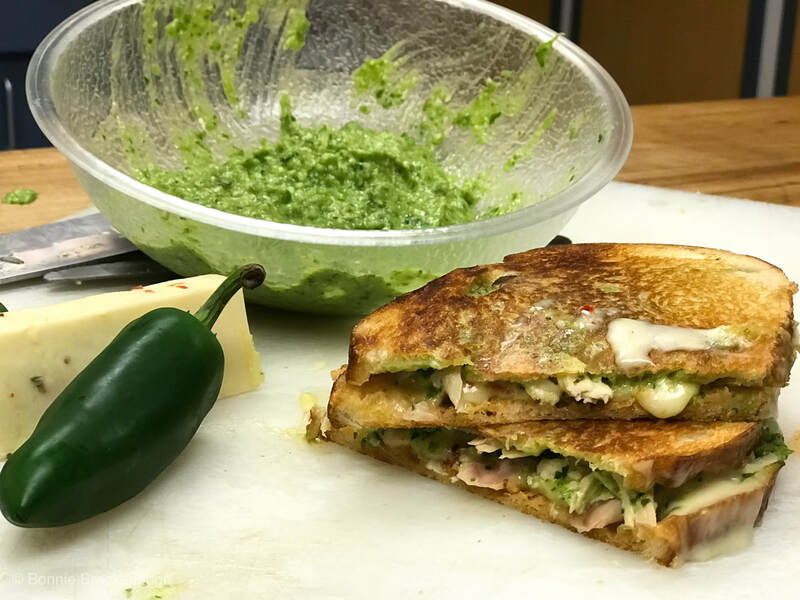 Spread a tablespoon of jalapeño pesto onto a slice of bread and the chipotle mayo on the other slice. Top the pesto slice on bread with the shredded chicken and a few slices of the pepper jack cheese. Place the chipotle slice on top. Grill in a panini press until crust is golden and cheese has melted. If you don't have a panini press, grill on a flat pan and flip each side until cheese has melted. Put jalapeños and garlic in a Cuisinart or blender and blend until finely chopped, scrape the mixture back down into the bowl. Add the basil, cilantro, parmesan, avocado, lime juice, and salt. Blend. Add the olive oil while the blender is on until everything is well incorporated. This pesto is good on so much more than just this panini. Wraps, burgers, pasta, whatever!